Our product range includes a wide range of lorry mounted co2 tankers. 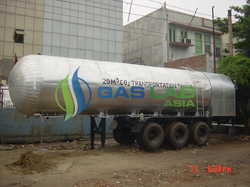 SS Gas Lab lorry mounted co2 tankers are designed in different capacities to make them suitable for the existing chasis. The PU insulation of these tankers is of higher thicknesses as no refrigeration system mostly required therein. Also, the material of construction, low temperature steel is carefully chosen. After insulation, aluminum cladding is done. Further, the tanker is provided with suitable piping arrangement on which safety valves, inlet-outlet pressure gauges and other safety and approved fittings are mounted. To suit local stipulation of explosives directorate, the essential chasis modifications can also be done. The fabrications and drawings are approved and supervised by international inspection agencies. We can undertake following modifications on the chasis, viz. height barrier, barrier around the tank, modification in the position of battery, rear red light and rear bumper.